This double chocolate zucchini bread is moist, delicious, and the perfect way to get your chocolate fix. You’ll forget that there is even zucchini in it! I got this yummy chocolate zucchini bread recipe from Nate’s aunt, and her from her mom. They make it is a cake in a 9×13 pan, and its delicious enough to be one. But I think a loaf of bread is cuter. It’s the season of ripe zucchini, and lots of it. We didn’t plant a garden this year because we’re still working on getting sprinklers and grass in our yard at our new house, let alone a garden. But next year we’ll have 4 garden boxes and you better believe I’ll be growing a zucchini plant to make this sweet zucchini bread all summer long! I love baking with zucchini because it makes me feel a little less guilty about eating sweets when they’re vegetables in the middle. This chocolate zucchini bread is so good however that you’ll forget about the zucchini inside of it at all, and instead think you’re eating a delicious slice of double chocolate cake! This double chocolate zucchini bread is made with double chocolate thanks to the cocoa powder in the batter and chocolate chips throughout. The chocolate chips give you those perfect extra bites of sweet chocolate throughout. The bread is kept moist and fudgy throughout thanks to the shredded zucchini, and since it uses oil and butter that keeps it extra moist too. The recipe makes two 9×5 inch loaves of bread, so this is the perfect recipe for sharing with your friends or your neighbors. I promise they’ll be super grateful for it! The recipe can be cut in half if you want as well. It’s not exactly healthy, but it is delicious, and I promise you’ll love it! If you have more ripe zucchini and need more zucchini recipes, I think you’ll also love our lemon zucchini bread, traditional zucchini bread, blueberry zucchini bread, or this banana zucchini bread. This double chocolate zucchini bread is moist, delicious, and the perfect way to get your chocolate fix. You'll forget that there is even zucchini in it! Mix flour, salt, baking soda, cinnamon, and cocoa powder in a large bowl. In another bowl mix together the sugar, oil, and butter. Add in the eggs, and vanilla and mix till combined. Stir the buttermilk into the wet mixture. Add the wet mixture to the dry ingredients, and stir everything together until just blended. Fold in the zucchini and then the chocolate chips. Prepare 2 9x5 loaf pans by spraying them with nonstick spray. Pour batter equally into the 2 loaf pans. Bake in oven for 50 to 60 minutes. Allow to cool in pan for a bit before removing and slicing. **Make your own buttermilk by adding 1/2 TBS vinegar to the 1/2 cup of milk. And allowing to sit for 10 minutes. 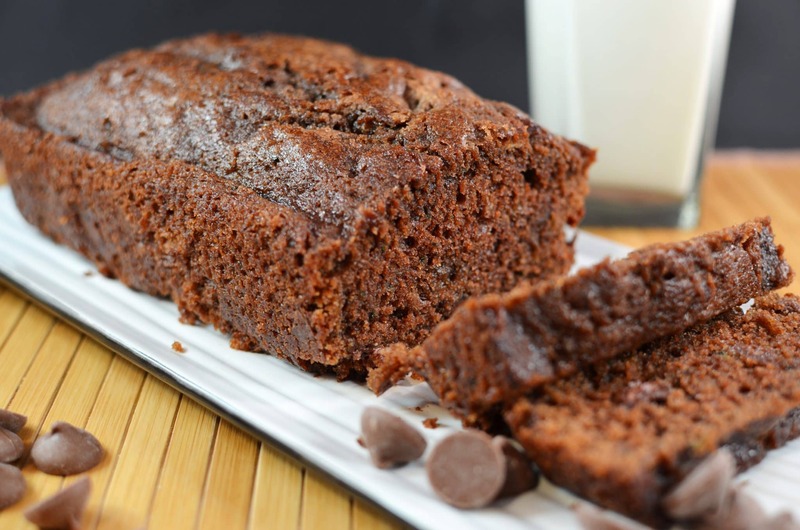 This double chocolate zucchini bread was first posted on September 11, 2012. Photos and text updated on July 18, 2018. This double chocolate zucchini bread is so freaking delicious. I am so glad the recipe makes two bread loaves because I gave one away and the one that I kept disappeared in no time. The family pointed out that I still have enough zucchini to make another batch. I still plan on sharing one because I want everyone to taste this 😋. Thank you for sharing !!! Loaf pans are different sizes; what size did you use? Thanks. I’ve actually cooked this in 2 different sized loaf pans, I have a glass pan that is a little smaller and a metal pan that is a 9×5 I believe. Whatever size you have will work, just watch closely for the last few minutes so you don’t burn the bread. I actually have 2 different sized loaf pans of my own that I use. One is a smaller glass pan and one is a 9×5 metal pan. Any size you have will work, just watch closely the last few minutes so you don’t burn the bread. Can you taste the zucchini? Or is that added to make this “better for you”? I’m not really sure if you can taste the zucchini. It doesn’t taste exactly like a normal chocolate bread or cake would, but of course it doesn’t taste just like zucchini either. I think its mostly to make it this healthier, but I think it also helps keep it really moist as well. Did you mean 1/2 a TBS of vinegar? Sarah, thanks for noticing that for me. Yes I did mean 1/2 TBS. I fixed the recipe as well, but thanks for pointing it out. Sorry you didn’t like it Cathy – one way you can get less oil in a recipe like this is by substituting half of the oil called for with applesauce. But in my opinion the point of zucchini bread (especially chocolate zucchini bread) is not to taste the zucchini, but as a way to sneak veggies into the sweet bread, and to keep the bread extra moist!